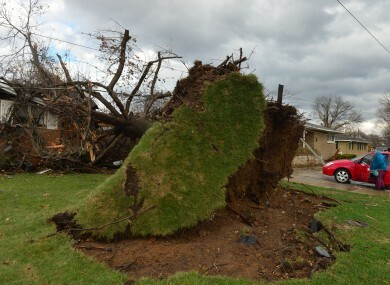 Trees were uprooted, cars flipped and houses flattened. A tree was pulled out of the ground by the roots, collapsing onto a house after a tornado left a path of devastation through the north end of Pekin. DOZENS OF TORNADOES and intense thunderstorms swept across the Midwest on Sunday, leaving at least six people dead and unleashing powerful winds that flattened entire neighbourhoods, flipped over cars and uprooted trees. Illinois took the brunt of the fury as the string of unusually powerful late-season tornadoes tore across the state, injuring dozens and even prompting officials at Chicago’s Soldier Field to evacuate the stands and delay the Bears game. “The whole neighbourhood’s gone. The wall of my fireplace is all that is left of my house,” said Michael Perdun, speaking by cellphone from the hard-hit central Illinois town of Washington, where he said his neighbourhood was wiped out in a matter of seconds. An elderly man and his sister were killed when a tornado hit their home in the rural southern Illinois community of New Minden, said coroner Mark Styninger. A third person died in Washington, while three others perished in Massac County in the far southern part of the state, said Patti Thompson of the Illinois Emergency Management Agency. She did not provide details. With communications difficult and many roads impassable, it remained unclear how many people might be hurt or whether the death toll would continue to climb. The Illinois National Guard said it had dispatched 10 firefighters and three vehicles to Washington to assist with immediate search and recovery operations. Whole blocks of houses were erased from the landscape in Washington, a rural community of 16,000, and Illinois State Police Trooper Dustin Pierce said the tornado cut a path from one end of town to the other, knocking down power lines, rupturing gas lines and ripping off roofs. An auto parts store with several people inside was reduced to a pile of bricks, metal and rebar; a battered car, its windshield impaled by a piece of lumber, was flung alongside it. Despite the devastation, all the employees managed to crawl out of the rubble unhurt, Pierce said. “I went over there immediately after the tornado, walking through the neighborhoods, and I couldn’t even tell what street I was on,” Washington Alderman Tyler Gee told WLS-TV. Among those who lost everything was Curt Zehr, who described the speed with which the tornado turned his farmhouse outside Washington into a mass of rubble scattered over hundreds of yards. His truck was sent flying and landed on an uprooted tree. At OSF Saint Francis Medical Center in Peoria, spokeswoman Amy Paul said 37 patients had been treated, eight with injuries ranging from broken bones to head injuries. Another hospital, Methodist Medical Center in Peoria, treated more than a dozen, but officials there said none of them were seriously injured. Steve Brewer, Methodist Medical Center’s chief operating officer, said doctors and other medical professionals were setting up a temporary emergency care centre to treat the injured before transporting them to hospitals, while others were dispatched to search through the rubble for survivors. By nightfall, Trooper Pierce said there were reports of looting in Washington. About 90 minutes after the tornado destroyed homes in Washington, the storm darkened downtown Chicago. As the rain and high winds slammed into the area, officials at Soldier Field evacuated the stands and ordered the Bears and Baltimore Ravens off the field. Fans were allowed back to their seats shortly after 2pm, and the game resumed after about a two-hour delay. Earlier, the Office of Emergency Management and Communications had issued a warning to fans, urging them “to take extra precautions and … appropriate measures to ensure their personal safety”. Just how many tornadoes hit was unclear. Although about 80 reports of tornadoes had come in as of Sunday night, Bill Bunting of the National Weather Service’s Storm Prediction Center in Norman, Oklahoma, said the actual number will likely be in the 30 to 40 range. He said that’s because the same tornado often gets reported multiple times. When the weather service was issuing its warning that severe weather was bearing down on the Midwest, officials said the last such warning issued so late in the season in November came in 2005, and the result was an outbreak of 49 tornadoes. Sunday’s storms followed warnings by the weather service that they were simply moving too fast for people to wait until they saw the weather to get ready. “This is a very dangerous situation,” said Russell Schneider, director of the Storm Prediction Center. Some 53 million people in 10 states were “at significant risk for thunderstorms and tornadoes,” he said. The White House issued a statement saying President Barack Obama had been briefed about the damage and was in touch with federal, state and local officials. Such severe weather this late in the season also carries the risk of surprise. “People can fall into complacency because they don’t see severe weather and tornadoes, but we do stress that they should keep a vigilant eye on the weather and have a means to hear a tornado warning because things can change very quickly,” said Matt Friedlein, a weather service meteorologist. The storm also slammed through parts of Wisconsin, Indiana, Michigan, Ohio and Kentucky as it made its way east into the mid-Atlantic states on Sunday night. Tornadoes, large hail and damaging winds tore through several communities, leaving thousands without power as emergency crews tried to clear roads. Friedlein said that such strong storms are rare this late in the year because there usually isn’t enough heat from the sun to sustain the thunderstorms. But he said temperatures Sunday were expected to reach into the 60s and 70s, which he said is warm enough to help produce severe weather when it is coupled with winds, which are typically stronger this time of year than in the summer. Email “Six killed as tornadoes tear across America's midwest”. Feedback on “Six killed as tornadoes tear across America's midwest”.